A T-shirt decorated at a friend’s birthday party. A Tintin T-shirt bought in Aix-en-Provence almost four years ago. A pair of Vancouver 2010 red mittens. A hat from our first Disneyland trip embroidered with his name. 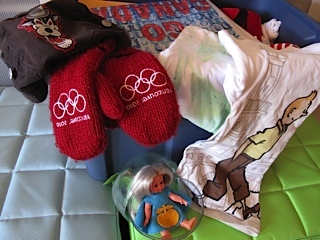 These were the four items, after a reorganization of his room and clothes closet, that were selected for deposit in my son’s memory box. A blue plastic bin which is home to other treasures including a few items which he wore as an infant and breastfeeding charts which I’m sure he’ll prize — or not — when he’s twenty. I’ve learned to be careful with what we save knowing that the instinct to keep it all is a sure path to clutter-mania and a heaviness of spirit which comes from the emotional trap of not being able to let things go. Even so, my ability to avoid amassing keepsakes, which has improved over time, remains variable. Despite my growing awareness and diligence around clutter (belied by the mountain of memorabilia and discarded items in our storage room – picture not included! ), I have safeguarded this box for the first decade of my son’s life because I believe connections to our past are important. While the collection I’ve begun on his behalf may be small, it dwarfs what has been preserved for me from my childhood. We moved a lot. I was born in Montreal and by the time I was twelve, we’d lived in Kuwait, Calgary, and Lebanon with other smaller stops in between. I think my mother, early in her married life, learned to keep things light. Making transcontinental, transatlantic moves economically forty to fifty years ago was not conducive to carrying a lot of “stuff” around. If you look at the accompanying photo you’ll spot a small doll whose blue dress sports a yellow apple. That is it. This is not the only, but it is the primary keepsake from my childhood. It was given to me by classmates at school when they heard I’d be leaving Lebanon and returning to Canada. I can picture my friends from that time, I even remember a few names, and I can always look at photos of them in the school yearbooks I have. ButI don’t know where they are today or what their lives may be like. A 15-year civil war in Lebanon, an era before instant electronic communication, and the need to adapt to a new culture, a new society, a new school, and new friends intervened, all playing a role in building distance between them and me. And so four items added to a blue plastic bin — a couple more boxes of school work and early artwork — may not seem like much for my son but it’s enough. Because it’s not the stuff you save but the memories you never forget which are your greatest treasures.